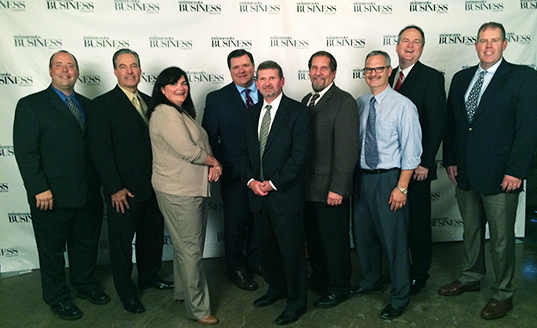 ST. PAUL (September, 2014) – Minnesota Business magazine has named Skyline Exhibits the Gold winner for the Minnesota Manufacturer of the Year, Best in Class: Large Company. The award recognizes overall excellence in the manufacturing industry in Minnesota. Skyline, based in Eagan, was also a top three finalist in 2013. Nominated companies were judged on significant achievements over the past few years, in new products or services, competitive improvements and successes. Skyline’s recent achievements include winning several exhibit design awards, new product design awards, winning the 2012 Outstanding Corporate Innovator Award given by the Product Development and Management Association (PDMA), and realizing growth 2 ½ times that of the exhibit industry. New products and services include the launch of several new exhibit systems including Envoy®, which has become Skyline’s most popular system, and the revolutionary WindScape®, the world’s first air powered exhibit system – and Skyline’s fastest-growing system. Both received industry awards for product design. Skyline also launched its new Creative Services Group (CSG), which offers creative content services like 3D animations, videos and promotions to its clients through a worldwide Dealer network.